Bloggers have also been wringing their hands. Nicholas Tozier of Song- facts asks explicitly: "Where is the Woody Guthrie of Occupy Wall Street?" His skepticism is almost palpable: "Sure, we've seen several jongleurs perform at the protest—Tom Morello, for example—but so far no musician has earned widespread attention from either mainstream or online media. Why should they? What have they given to Wall Street Occupants that can't be gotten from an iPod? "3 One of Tozier's readers—StrongWriterDean from Anaheim, California—responded to this challenging rhetorical question: "I believe the reason you don't see any Pete Seegers or Woody Guthries evolving out of these 'protests' is that the recipe is missing a couple of ingredients. Namely, these 'Occupy' rallies did not materialize organically like past events (Berkeley, Columbia, Selma, Prohibition, etc.). But I think you'll hear songs emerge, because it's something to write about. Even the Tea Party demonstrations deserve more relevance in folk culture than 'Occupy Wall Street.' But you can't write songs about that. Be- sides, have you heard the 'Hey Hey' chants com- ing out of Zuccotti Park? Not exactly Phil Ochs or John Lennon!" One might disagree with some of the particulars of StrongWriterDean's conclusions, particularly the implication that there was no deliberate organization to the previous "events" he mentions, but there is one striking opposition that he and the other commentators set up: the emergence of a protest singer of great stature, on the one hand, and the emergence of protest songs, on the other. Tozier assures us: "What I'm absolutely certain of ... is that the present demonstrations aren't going to magically deliver us a Dylan or Guthrie. Both of those figures worked hard, wrote prolifically and thoughtfully, and toured extensively. If the next great American protest singer is out there somewhere, she's got a lot of work to do and even more noise to cut through." Dylan, Guthrie, Seeger, Ochs, Lennon—these, apparently, are the benchmarks for acknowledging the emergence of any musical protest movement worth acknowledging. Otherwise: "Sure, we've seen several jongleurs perform at the protest... ."
Not being adept in French, I had to look that word up. Jongleur (from Old French): "an itinerant medieval entertainer proficient in juggling, acrobatics, music, and recitation." That doesn't quite sound like Tom Morello, but I suppose it might describe me, a "proficient" amateur who has taken his guitar to a number of picket lines and Occupy camps in Britain and Ireland. And, for those who haven't experienced it personally, it might be worth looking at the YouTube videomaker biamaku's visualization of Ry Cooder's OWS anthem, "Looking for the Wall Street Part of Town. "4 There one will see at least sixteen intercuts of anonymous musicians—fiddlers, banjoists, guitarists, percussionists, an entire youth orchestra—against only one universally recognizable face (Joan Baez). I can't speak for any of the musicians on that video, but I can say that in the UK and Ireland, at least, when a musician turns up in solidarity at a protest or a picket line with a guitar strapped to his or her back, the association is inevitably made (albeit jokingly): "Hey Woody ... Does yer machine there kill fascists?" But behind the joke lies an important consideration. Perhaps the British and the Irish have kept sight of something apparently forgotten by those Americans pining for their OWS balladeer: Woody Guthrie was Woody Guthrie even before, especially before, he became famous. He was Woody Guthrie before he recorded Dust Bowl Ballads in 1940, which catapulted him into the national spotlight, and before he'd published the largely self-mythologizing Bound for Glory in 1942, which clinched his celebrity. 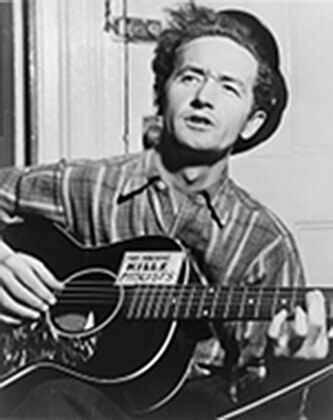 He had already been Woody Guthrie when he and Will Geer went out in 1938 to fortify the migrant workers organizing, striking, and defending themselves against the gun thugs and vigilantes in the hire of the Associated Farmers in the Californian fields. He was simply doing what he did best: looking, listening, writing, and singing—certainly not aware that he was laying the foundations for the modern protest-song movement or any other movement for that matter. Having said this, the critics of OWS music do have one important point. To repeat StrongWriterDean: "Have you heard the 'Hey Hey' chants coming out of Zuccotti Park? Not exactly Phil Ochs or John Lennon!" The importance of writing "thoughtfully," however quickly or slowly, cannot be overemphasized. But it is also worth remembering that many of Woody Guthrie's greatest songs were already written before he had achieved any celebrity to speak of. This is particularly true of Dust Bowl Ballads; imagine those blessed "Oakies" in the migrant camps being serenaded with "Tom Joad," "Pretty Boy Floyd," and "Jesus Christ" years before they were committed to vinyl. The night before the Oct. 6 start of the occupation of Freedom Plaza, the singer-songwriting duo Emma's Revolution stood before a packed protest-planning rally at Busboys and Poets, fiddling with chords, harmonies and a lyric sheet. They were in town from Occupy Boston and were still getting the hang of a song they had been inspired to write on the road down: "Occupy D.C."
Who are we? Occupy D.C.
Woody Guthrie could not have asked for more. He would have applauded, as he did in 1946, those jongleursbanging "on cheap guitars and banjos their songs old and new that keep their streets singing and foaming with hate for the Money Powers and love for the workers. "11 Guthrie's work is still being done at every Occupy camp and on every picket line where songs are being sung—as well as on YouTube, Spotify, Last.fm, and all across the cyber universe. 1 Christy Moore, email to Will Kaufman, 22 February 2006. 2 James C. McKinley, "At the Protest, the Message Lacks a Melody," New York Times, 18 October 2011,http://www.nytimes.com/2011/10/19/arts/music/occupy-wall-street-protest-lacks-an-anthem.html. 3 Nicholas Tozier, "Where is the Woody Guthrie of Occupy Wall Street?," Songfacts:http://www.songfacts.com/blog/writing/where_is_the_woody_guthrie_of_ occupy_wall_street_/. 4 biamaku, "Ry Cooder's 'Looking for the Wall Street Part of Town'," http:// www.youtube.com/watch?v=IMT1SQA7dBE. 5 Woody Guthrie to Almanac Singers, 8 July 1941, Woody Guthrie Archives, Woody Guthrie Correspondence Series 1, Box 1, Folder 3. 7 David Rovics, Sing for Your Supper: A DIY Guide to Playing Music, Writing Songs, and Booking Your Own Gigs (Oakland, CA: PM Press, 2008), 7. See also www.davidrovics.com. 8 Rovics, Sing for Your Supper, 34. 9 David Montgomery, "Amid 'Occupy,' Protest Music Gets Rebirth," Washington Post, 17 October 2011,http://www.cbsnews.com/2100-502223_162-20121399.html?tag=contentMain;contentBody. 11 Woody Guthrie, "Peoples Songs and Its People," 7 (19 March 1946), Woody Guthrie Archives, Manuscripts 1, Box 4, Folder 25. The Woody Guthrie Archives: "A Good Job of Work"